House of Fraser customers have been told that they’ll get no refunds for goods ordered online but undelivered before the chain was bought last month. New owner Sports Direct said people must “contact the administrators” to chase their cash. They will join a long queue of other creditors – meaning there’ll be little chance of getting their money back. One customer told the BBC: “I am fuming about this whole situation and just want my money back”. Mike Ashley’s Sports Direct agreed to buy the department store for £90m on 10 August hours after the 169-year-old chain went into administration when talks with its creditors failed to reach an agreement. But on 15 August they took down the website, leaving online customers in the dark about their goods orders or their cash. After an outcry from customers, House of Fraser on 16 August said it would refund customers and also cancel all online orders. Due to delays with delivering online orders, we have taken the decision to cancel and refund all orders that have not already been sent to customers. All customers affected will receive an email in the next couple of days. Please accept our apologies for any inconvenience caused. But this week a spokesperson for House of Fraser told the BBC: “The comment made on social media on August 16 can by definition only relate to orders received by the current company. In other words, anyone who made an order before the takeover and owed money will be in a long line of creditors owed money. That means it’s likely they will only get a small part of the money they are owed back. The indications are that the administrators could take around a year to sort things out and that unsecured creditors could be offered a paltry amount, around a penny in the pound. That would mean anyone who ordered, for example, £300-worth of goods could only expect to get £3 back, if anything. Is there another way to get my money back? If you spent more than £100 and paid by credit card, you may be able to claim the cash back from your credit card provider. Section 75 of the Consumer Credit Act can make credit card providers jointly liable for breaches of contract with a trader when people buy on plastic. It means shoppers should not be left out of pocket if an item is faulty, the retailer goes out of business or it does not deliver what it has promised. Consumers are potentially protected for the total value of their purchase – provided the total cost of the item is between £100 and £30,000 – even if they only used a credit card for part of the payment. If you want to make a claim, you simply need to contact your credit card issuer and tell it you’re making a claim under section 75 of the Consumer Credit Act. It should send you a claim form. Consumer website Which? has a template which could help. If your credit provider won’t play ball, then you can contact the Financial Ombudsman to make a complaint. 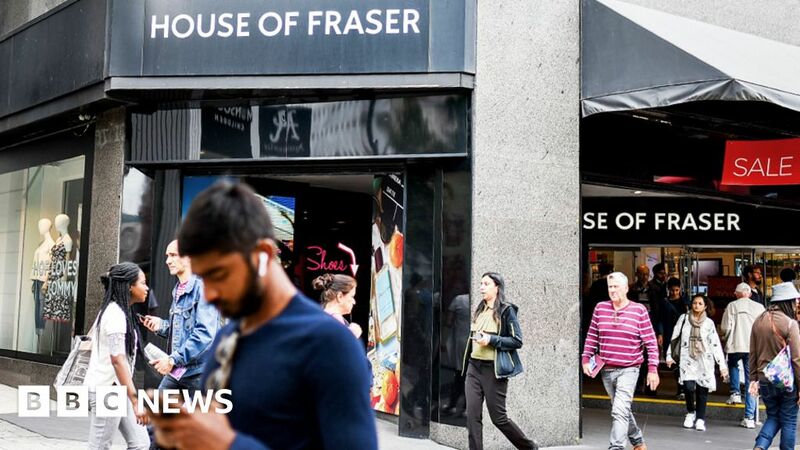 People who ordered and paid for goods online after 10 August but before the website was taken down can’t make a claim on the credit card and should still be dealing with House of Fraser about their cash and goods, the company said. But that hasn’t prove easy, as angry customer Simon Harrington, pictured, told the BBC. “On 13th August my wife ordered and paid for two shirts from House of Fraser for £77 and the money was taken from our account that day. In desperation last weekend the couple went into their local store, Jolly’s in Bath, where staff were unable to help. He added: “I used to buy all my suits, shirts etc from House of Fraser and won’t be shopping there ever again. Nor will I ever be going to Sports Direct either. House of Fraser refused to discuss individual cases.